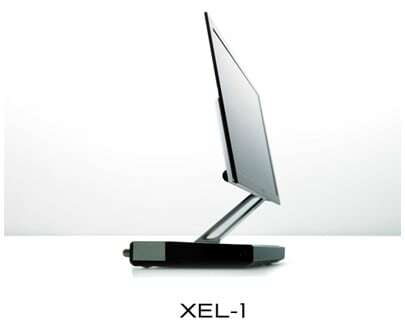 Sony today introduced the world's first*1 OLED (organic light-emitting diode) TV, "XEL-1". The 11-inch OLED TV "XEL-1" proposes a ground-breaking new TV design, with its astonishing thinness measuring approximately 3mm (at its thinnest point). "XEL-1" also incorporates Sony's independently developed "Organic Panel*2", which realizes advantages such as high contrast, high peak brightness, color reproduction, rapid response time, all of which combine to deliver unparalleled image quality. *1As of October 1, 2007. Based on Sony research. * Main Features of "XEL-1"
As OLEDs are light-emitting, there is no need for a separate light source such as a backlight system. Sony's "Organic Panel" consists of an organic material layer of just several hundred nanometers thickness, with two extremely thin glass panels aligned on either side of the organic material layer. This realizes a new TV form factor measuring approximately 3mm at its thinnest point. With its light-emitting structure, the OLED display can prevent light emission when reproducing shades of black, enabling "XEL-1" to reproduce very deep blacks (contrast ratio 1,000,000:1). Furthermore, XEL-1 can control all the phases of light emission from zero to peak brightness, generating color expression and subtleties conventional displays cannot match. "Super Top Emission," a technology unique to Sony and incorporated in its "Organic Panel" has a high aperture ratio which allows for efficient light emission from the organic materials, realizing high peak brightness. This enables "XEL-1" to faithfully reproduce light flow such as reflections of sun light or camera flashlights through the image reproduced on the display. In order to use OLED to generate the full spectrum of Sony's TV color requirements, Sony developed its own proprietary organic materials, with bright coloration. In addition, the micro-cavity structure of "Super Top Emission" and the color extracting technology within its embedded color filter enable "XEL-1" to reproduce natural colors beautifully. As a result, the fresh colors of ripe fruit and shades of deep cobalt blue can be stunningly reproduced. The "Organic Panel" can also sustain its color reproduction capability in scenes of diminished brightness, enabling "XEL-1" to faithfully recreate even dark movie scenes using the colors that were originally intended. Since OLED can spontaneously turn the light emitted from the organic material layer on and off, OLED is capable of very rapid response times. Newly developed OLED drive circuits enable "XEL-1" to reproduce fast moving images such as sports scenes smoothly and naturally. OLED does not require a separate light source due to its light-emitting structure, therefore it can be powered using very low voltages. This means that OLED TVs consume extremely low levels of power compared with other display devices. The power consumption of "XEL-1" is as low as 45W. A simple design, in which the thin, light display is sustained by an aluminum side arm, represents the sensation of floating, and has delivers a revolutionary design befitting the world's first OLED TV. Also, the rear panel combines black and mirror-like metal surfaces, which together with the balanced front and side design completes its sophisticated overall appearance. Matching this slim and advanced body design, "XEL-1" comes with a slim and stylish remote controller.